Image 1 of 9. Click to view fullscreen. This sunny 2 bedroom plus sleepout property is in the perfect locatation, directly across the road from the beach. 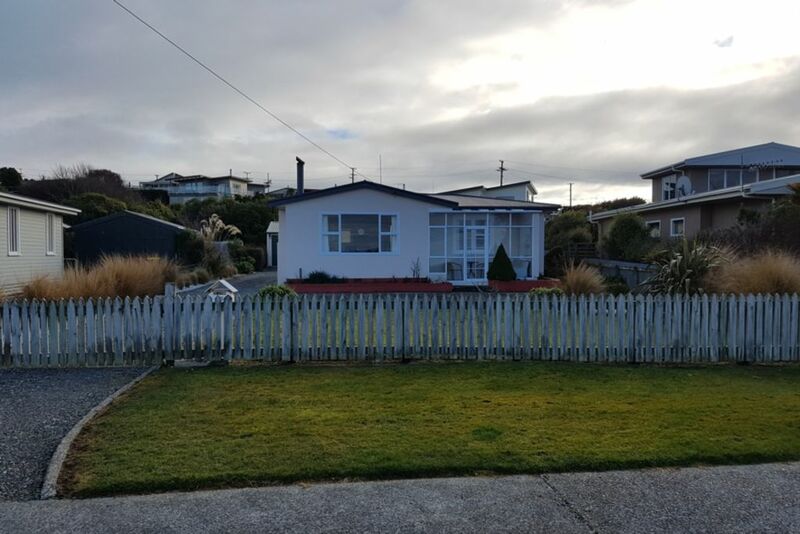 The house itself is perfect for a family holiday with a fully fenced section, a backyard perfect for cricket, a playground 100m down the road and plenty of room with enough beds to sleep 8 people. It is also ideal for a relaxing getaway with great views at the kitchen table or from the sunfilled conservatory. The house has a modern kitchen with dishwasher, a BBQ and brazier out the back for entertaining but if you dont feel like cooking you have takeaways 100m down the road, a cafe/bar 10 min walk away as well as 2 Hotels a short drive away. The living area has a fire for colder nights, with 3 and 2 seater couches to relax on and TV with freeview. The bathroom has a shower and the laundry has a washing machine with washing line in the backyard. You also have plenty of room for vehicles, boats, jet skis or kayaks with a double garage. If you enjoy walking Moores Reserve is a 5 min drive away which has 3 walking tracks that go to look out points. Riverton is a short drive to Colac Bay, Cosy Nook and Monkey Island. Great house in a perfect location! Just perfect in every way !! Lovely clean house in a quiet area and right opposite the beach. Fantastic place to stay and very close to the beach and kids play ground. We loved it! Great! We look forward to staying again in the future.